Parker McCay welcomed three summer associates to our Mount Laurel office on June 4, 2018. All are rising third year students – Hannah Franke at Rutgers University School of Law; Tanner McCarron at Villanova University Charles Widger School of Law, and Christopher Tappan at Drexel University Thomas R. Kline School of Law. Parker McCay’s summer associate program gives law students a glimpse into life as a first-year attorney. 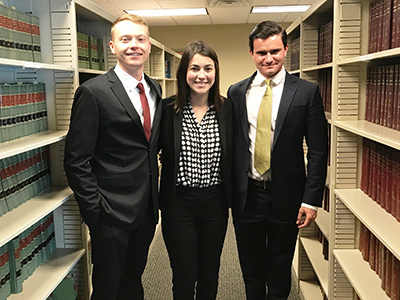 During their time with the firm, Hannah, Tanner, and Christopher will rotate through several different practice areas to learn more about the day-to-day aspects of working in a legal firm. Mentored by firm associate attorneys, the law students will have the opportunity to gain exposure and hands-on experience in a wide range of matters. Current and former summer associates rate Parker McCay’s program highly. They feel that the experience provides them with a good foundation on what to expect after law school, as well as meaningful work to help build their resumes. Several students who have been through the program have joined the firm in the fall as full-time attorneys.